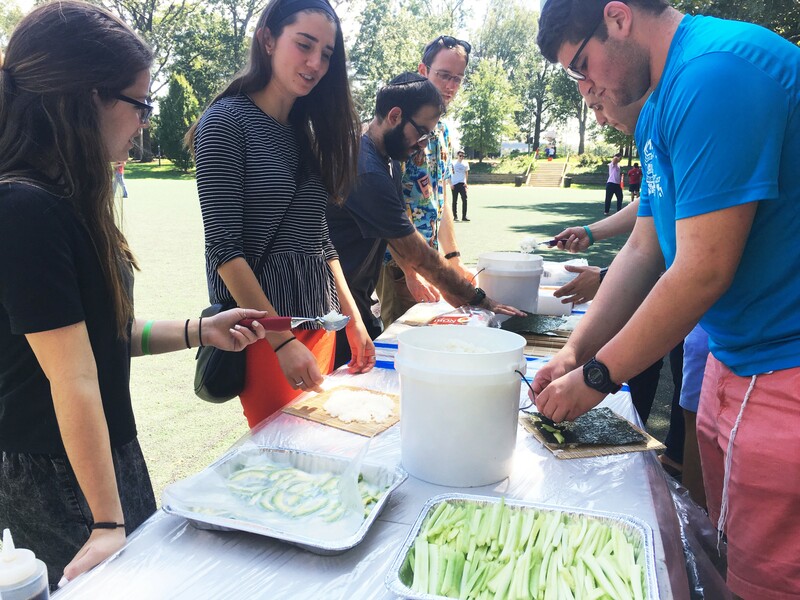 When most people think ‘Jewish event,’ the thought isn’t followed by ‘sushi.’ But for UMD Chabad, sushi is an annual tradition that allows students to get to know the organization in the first week of classes. 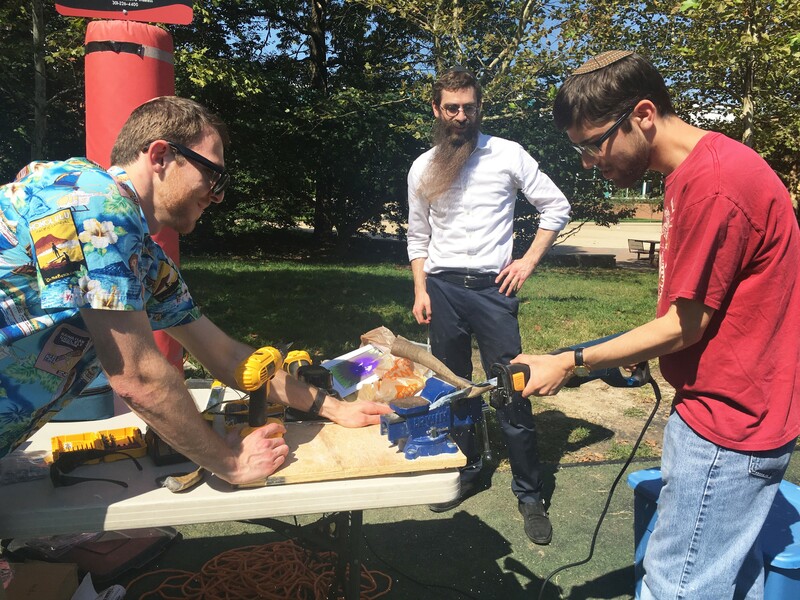 Chabad hosted its annual Labor Day fair Monday from 1 to 3 p.m. on La Plata beach. The fair allowed attendees to roll their own sushi for lunch and do crafts. About 20 students filtered through at a time, talking to friends and playing sports on the grass. Family and alumni also attended the fair. Rabbi Eli Backman said Chabad has hosted this event on North Campus for around 20 years. Sushi-making has been part of the tradition for years since a part-time chef in the Jewish community came up with the idea. Students make their own California rolls for lunch at La Plata beach for Labor Day. Jacqueline Hyman/Mitzpeh. Other activities have varied through the years, with shofar-making as a principle craft when the event lines up closely with Rosh Hashanah. This is the first year spin art was included. Junior Jewish studies major Aliza Silverman said she enjoyed meeting new people and seeing friends that she hadn’t seen over the summer. 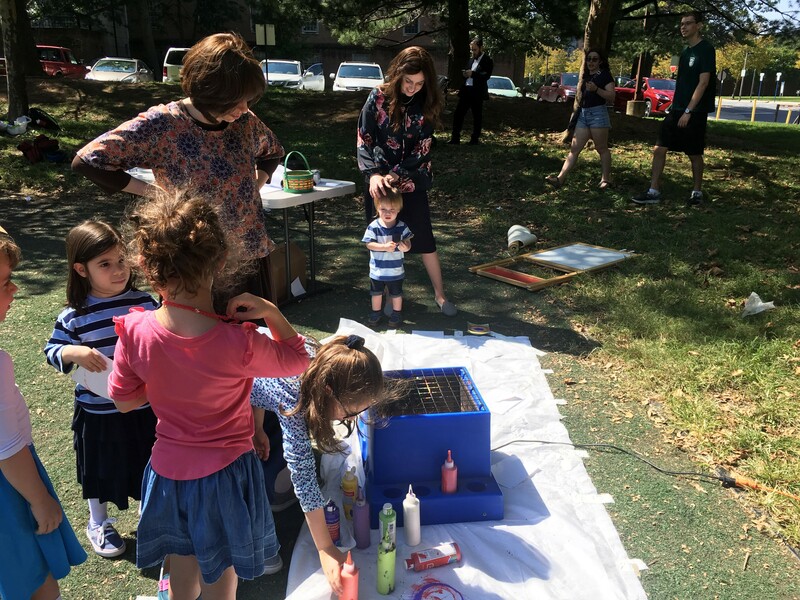 Children create colorful spin art at Chabad’s Labor Day fair. Jacqueline Hyman/Mitzpeh. Backman said Chabad generally relies on student volunteers to help set up the event. Meanwhile, junior Aaron Kraiman ran around telling attendees and passers-by about a new Chabad-based “fraternity” they’re calling Chai Beta Delta. The kinesiology major said he was using the fair as an unofficial rush event for the group, which would be based out of the Chabad building. Attendees cut the end off a ram’s horn to make a shofar after watching Rabbi Levi Raskin demonstrate. Jacqueline Hyman/Mitzpeh. “Most Orthodox Jews don’t really have the opportunity to participate in Greek life,” Kraiman said, citing their inability to partake in Greek events during Shabbat. Others have toyed with the idea, Kraiman said, but he’s been taking it to the next level by putting up signs and posters. He said he wants Jewish students to have the opportunity for a Greek life atmosphere. Rabbi Levi Raskin from JCrafts led the shofar-making, and individual students went to craft their own with his help. They hollowed out the horns with power tools, sanded them down, and finished the shofars with a varnish. Others casually played frisbee, baseball and football throughout the event, creating a relaxing atmosphere. No Replies to "Students, alumni gather to make sushi, see friends on Labor Day"